The point here is supposed to be that even in an area of healthcare where there’s no insurance and we have to pay everything out of pocket, costs are still skyrocketing. So maybe having “skin in the game” doesn’t really have much effect after all. So which data is correct? Beats me. 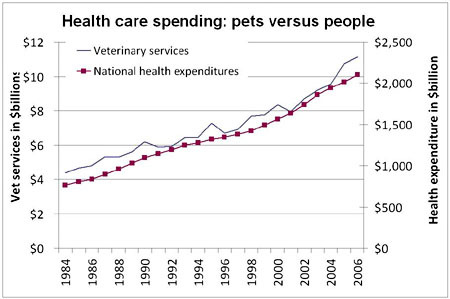 But considering the high-pressure sales job vets have adopted in recent years, I have a hard time believing that cat expenditures have gone down. After all, we didn’t use to get their teeth cleaned or spend a couple hundred bucks a year on fancy flea/heartworm/hookworm/etc. goop. Now we do. Caveat emptor.